The Monobloc Sport horseshoe from American Equus. 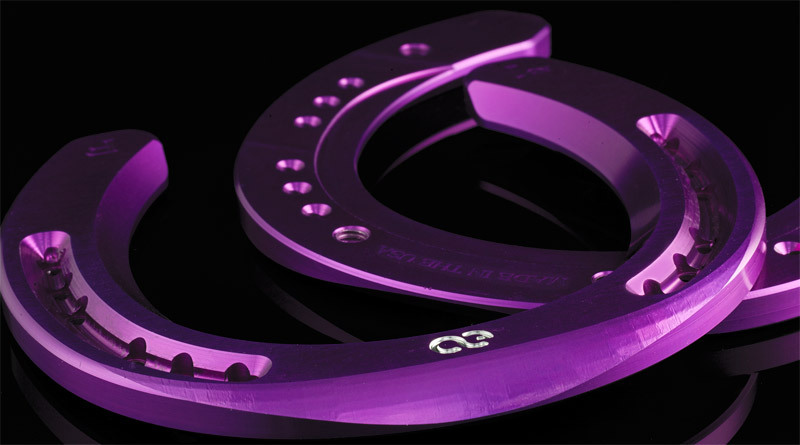 Horseshoes made of aircraft-grade aluminium are the latest innovation for equestrian sports from dressage and jumping to reining and polo. American Equus is about to launch its MonoBloc Sport Horseshoe, following months of research and assistance from a panel of world-renowned farriers. Crafted from solid .5″ 6061 T6 Aircraft Grade Billet Aluminum, MonoBloc Sport Horseshoes are 65% lighter than steel shoes and will be available in a variety of deep anodized colors that help prevent oxidation and fungus growth typically seen in high moisture environments. Other features include a rolled front edge for a comfortable break-over, tabbed edges, and unique counter-sunk and beveled topside nail holes. The tabbed edges are designed to prevent hoof shearing when jumping, the company said, and the absence of a steel wear bar encourages the shoes to have natural wear patterns. The MonoBloc Sport Horseshoe will enter the market in the fall of 2017, and will be available through selected farriers. Headquartered in Gilbert, Arizona, American Equus also makes spurs and stirrups. The company was founded by David Shano to help his daughter, Chloe, stay secure in her stirrups as she moved up the levels in hunters and jumpers. Shano, who owns and manages several engineering and manufacturing firms in Arizona, immediately noticed that there was an opportunity to improve upon current stirrup design and production methods around the world. Putting his years of engineering skills and experience to work, he developed a new product that is safe and stylish. The stirrups are used in many disciplines, and six of the top ten thoroughbred racing jockeys in the US ride in American Equus stirrups. The most famous is recent Dubai World Cup winner Arrogate, ridden by Mike Smith. Another horse shoe designed by an engineering manufacturer whose kid rides, are they really countersunk round nail holes?? More junk in the horse industry.